I first saw Barbara Vos’s work in 1992 in a show entitled Absence of Proof” at Somar Art Gallery in San Francisco, Ca., recently renamed Somarts. The exhibit also included Gustavo Rivera and David Miller’s work. I was immediately struck by the energy and boldness in Vos’s work. One painting in particular grabbed my attention: a huge acrylic paper painting entitled, “Maiden Voyage” with ‘faster than a speeding bullet’ strokes of reds and blacks, dark forest and pure kelly greens and freedom, lots and lots of freedom. Barbara Vos hadn’t been exploring abstract painting for long and one could sense the excitement of new in the huge paintings. The excitement was contagious as Kenneth Baker of the San Francisco Chronicle wrote a glowing review followed by Union Square gallerist Brian Gross offering Vos gallery representation, from 1992 – 2004, I might add. Local girl made real good. Barbara Vos grew up in the Brooklyn /New York City area. She didn’t have a chance of not being a painter or of at least exploring it, as she came from a long line of painters: both parents, great aunts and uncles, painters all. Vos spent her early years hanging out in museums where she was affected by notables such as John Marin, Kandinsky early Guston , Van Gogh, Cezanne. 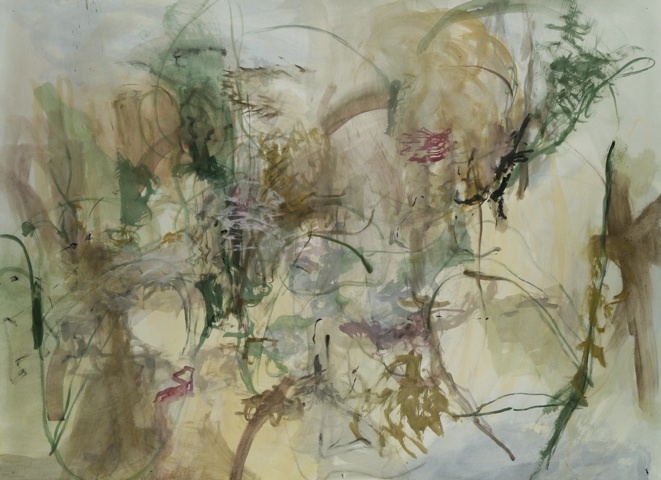 Of Marin’s work Vos states,” I recognized how I felt seeing a so small and beautifully, delicately described watercolor.” Vos was hooked. Less interested in a single idea and more with interpreting a collection of thoughts and moods, abstraction lends a song without words for Barbara Vos. Perhaps this is what sets her apart from other abstractionists, her pure painting wordlessness. While many painters have resorted to ‘bells and whistles’ in post modernism’s abstracted ‘decorative’ period to find footing in a bruised art form of the 1980’s and 90’s, Vos has never deviated from her need to express herself sincerely in a straightforward manner through paint. Not looking for style and finish in her work, just a statement. An intuitive painter, Vos says, “Impulse and chance needs to be in the movement of the body, not filtered through the mind, a separate channel.” Perhaps that’s why Vos prefers working very large, to allow the body’s full expression when painting. Mark Rothko said ‘an intimacy’. Residing in San Francisco, Ca. since the 1980’s, in 1993, Barbara Vos was awarded a residency with the coveted Djerassi Artist-In-Resident program in Woodside, Ca. ; a month’s long hiatus for the artist to work in a different environment in the production of new work. During that period one of the more successful paintings Vos produced was “Red Spirit” an acrylic painting on paper with a web of Vos’s best edgy strokes, forest greens set against an all white background with a lone red spiral placed center low with red strokes escaping upward. “Gardenesque (June)”, 2009, (one of six Gardenesques): a sunny exquisite profusion of yellows, smatterings of pearl grey, touches of red, in a luscious spring bouquet, much too dense to walk through though. “Spring Fed” (2008), a very large delicate, threadbare treatment of paint with jabs and strokes of ocher against sky blue and pearl gray background with feathery dark green vines set into a gray blue mist; reminiscent of Joan Mitchell. “Rythms” from 2008, a sunny yellow and forest green tangled web of color. “Bridge # 1” and “Bridge# 2”, both from ’09 and both densely layered. One could almost experience vertigo viewing each. Bridge #1 hovers over shimmering blue water with fog rolling in; loosely set in tones of blue with flickering pinky peach a sunset might produce; perhaps Vos had the Golden Gate Bridge in mind. Bridge #2 is more densely built, packed in yellows and gray browns almost as if the viewer were atop the bridge looking down upon an industrial area and/or a city population. Both paintings exude a sense of the bridges’ immense size and weight but the fact that Vos has successfully captured their suspension, the rolling feeling of fog or mist gives them an other worldly quality and no apparent footing to hold down their eerie lightness. Barbara Vos was the recipient of the Merceldes Eicholz Fellowship in 1994 and the Nea/WESTAF Regional Fellowship in 1996. Vos’s work is in the Morgan Flagg Collection shown at the De Young Museum of Art in San Francisco, Ca; Bay Area Art from the Morgan Flagg colletion; also the di Rosa Preserve permanent collection in Sonoma, Ca. Selected exhibits: the Palace of fine arts in San Francisco, Ca; Mills College in Oakland, Ca. ; Sonoma State University, Ca. and Palo Alto Cultural Center, Palo Alto Ca.